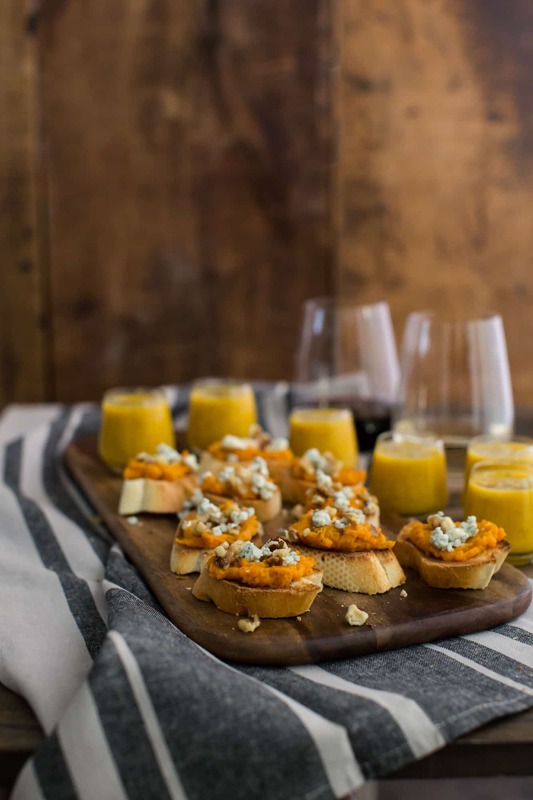 Sweet Potato Crostini and Butternut Squash Soup | Naturally. It’s a two recipe post day (I guess I’m trying to catch up for a slight slow down in recipes as of late.) 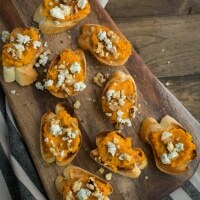 This post is all about appetizers because besides being fall, we’re also entering party season (at least for me!) There is nothing better then getting together with a group of friends around good food and wine. I have a few rules for when I have people over and it usually goes: There has to be food. There has to be wine. The food must be fairly easy to throw together (I like to actually enjoying being in the party and not always in the kitchen)! I kept the ingredients simple for both of the recipes to let the seasonal produce shine with the Danish blue cheese and walnut toppings (you might have noticed I have a penchant for blue cheese and fall produce!) Of course, no get-together would be complete without the wine. I don’t talk a lot about wine on this site only because my knowledge is still in the learning phase (and what better place to learn then in Northern California.) However, I always keep a bottle of Pinot Gris and Pinot Noir on hand to go with the appetizers. Preheat oven to 425˚. Place sweet potato on a rimmed baking tray, pierce with a fork a few times and bake for 45-60 minutes, until the sweet potato is tender. Remove from oven and let cool slightly before handling. Turn the oven broiler on. Cut the baguette into 1/2″ thick slices. Cut the garlic clove in half and rub over one side of the pieces then brush with olive oil. Place until the broiler and bake until crisp, 60-90 seconds (watch closely!) Remove from oven and set aside. Remove sweet potato from the skin and measure approximately 1 cup mashed and combine in a bowl with butter, maple syrup, salt and pepper to taste. 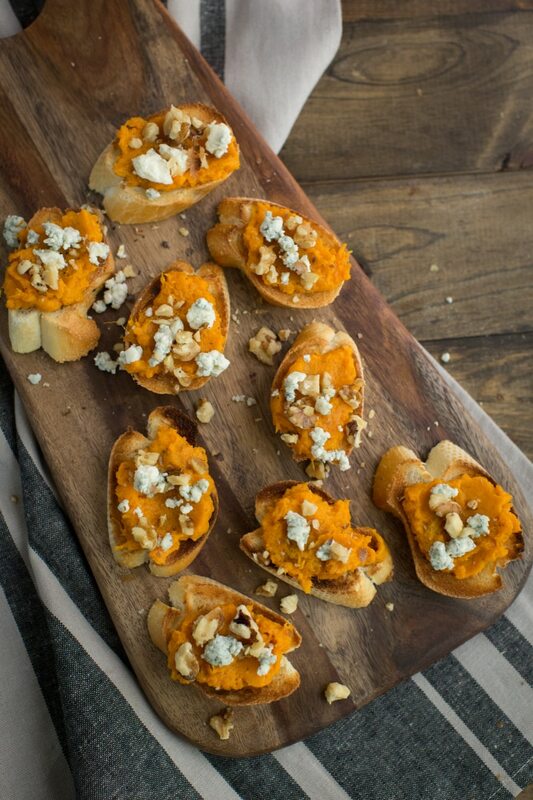 When ready to serve, spread a spoonful of the sweet potato mixture on top of each piece of bread and sprinkle with blue cheese crumbles and walnuts. Preheat oven to 425˚. Cut butternut squash in half length-wise and place cut side down in a roasting dish. Fill the dish with roughly 1/4″ of water and roast squash until tender, 40-60 minutes depending on the side of squash. Remove from oven and let cool enough to handle. In a pot, heat olive oil over medium-low heat. Add onion and cook until translucent and fragrant, 6-8 minutes. Stir in 1 cup vegetable broth, thyme, black pepper, and 2 cups of the roasted butternut squash. Cook for 5 minutes. Add in the heavy cream then puree soup using an immersion blender or traditional blender, adding extra broth as needed to reach a good consistency. Taste and adjust salt as needed. That soup looks delicious! I especially like that it’s in a cute little glass. Goes perfect with those toasts! 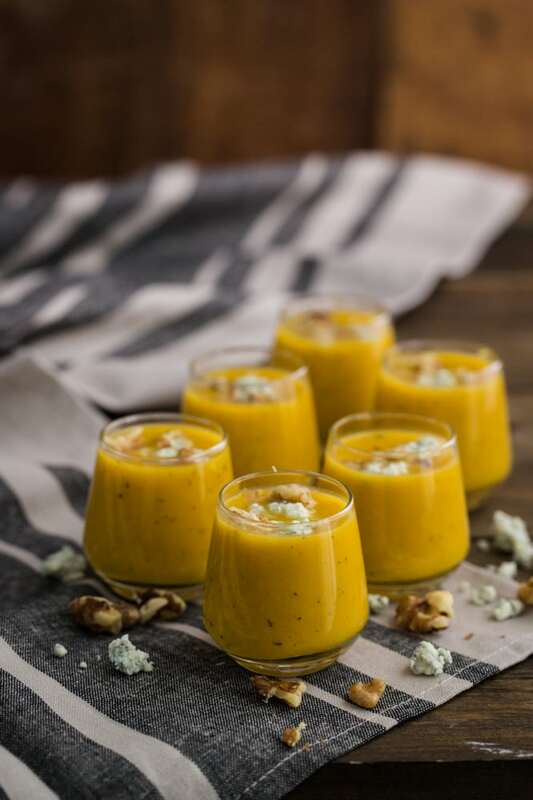 Butternut squash soup is seriously one of my fall favorites! The blue cheese and walnuts throw it over the edge for me 🙂 Delish! These look stunning! You captured the colours and flavours of fall beautifully. Love these fall flavors and colors! The crostini look amazing and I love the presentation of the soup. This is perfect timing! I’m having a get together on Friday and wanted something classy/fairly healthy that didn’t take too long, yumm. As a side note, I was watching an episode of that Italian cooking show with Lydia Bostianich (sp?) and she said it’s better to put the olive oil on after you toast the bread. I thought it might be worth trying next time! Oh interesting! I’ll have to try that next time! Love those crostini- so unique! They’d make the perfect little starter for our halloween dinner on Friday; I think they’ll have to go on the menu! I love the soup in the glasses, too. 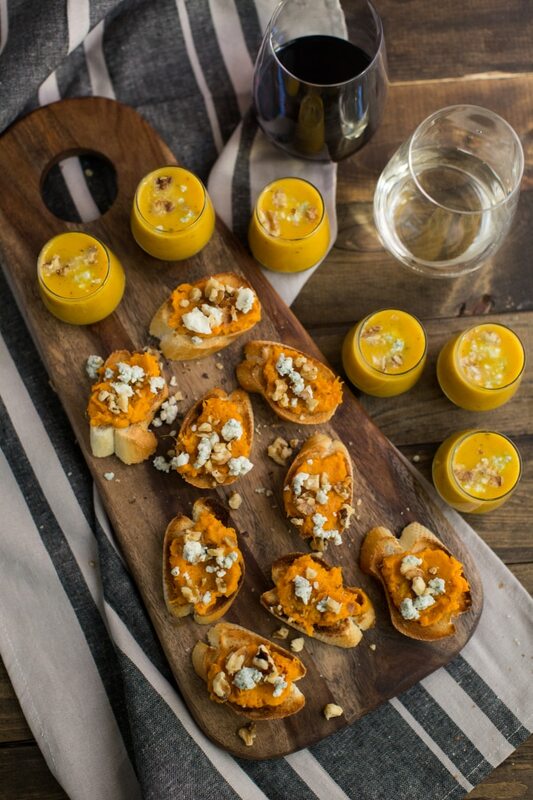 It shows off the beautiful color of the butternut squash and looks so pretty with the garnishes. Nice! Looks amazing Erin! I love butternut squash soup and love adding some cinnamon for warmth! I love butternut squash, and this soup sounds delicious. It looks so appetizing and very beautiful. I love butternut squash everything! I even add it to smoothies 🙂 This looks like a lovely brunch recipe. I love the soup! Have you tried topping with currants too? I had it that way at Canyon Ranch and now I always top squash or sweet potato soups with them. It gives a nice sweetness. Oh wow these crostini sound outstanding. I have a feeling they would become our main dish and we would forgo dinner 😉 I love the maple, walnut, blue cheese combo! I might be late posting here, but it’s with such a good reason. We just prepared these this past weekend with amazing success. EVERYONE loved them. We shaved some dried currants and cranberries and crumbled the slightest bit of blue cheese onto the soup and it was a huge hit. Really grateful to have found this blog, and inspired to continue trying new things that are not just healthy but delicious too. This soup has become my absolute favorite meal!! It’s so incredibly tasty and you can vary it with whatever toppings. Last night I had it with butter fried mushrooms and leeks and a dollop of creme fraiche 🙂 Thanks so much for sharing this recipe! The ingredients list includes two tablespoons of heavy cream. However, I do not see it mentioned in the instructions. I assume that it is added after the pureeing, then the soup is warmed up. Is this correct?